As we welc ome in the New Year, we also greeted some major cold fronts. Here is your Homosassa fishing report January 2018. The cold fronts were fierce and long lasting; lack of sunshine combined with multiple days of chilly weather brought the Gulf water temperatures down into the 50’s. Many of our target species aren’t physically equipped to handle extreme extended cold water. Fish go into survival mode and seek shelter and warmer water. Thankfully in our region, with the Chassahowistka, Homosassa and Crystal River being spring fed rivers the 72-degree fresh water, mixing with the 52-degree waters of the Gulf of Mexico, give redfish, trout and snook areas within the estuary (where salt water and fresh water meet) to escape the cold. Seatrout and redfish will find potholes or depressions in the rivers, to seek shelter. Snook being more of a tropical species will head closer to the springs. 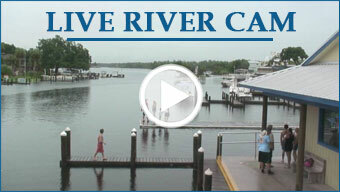 You’ll also find schools of mangrove snapper and jack crevalles closer to the headsprings during times of extreme cold. The fun part of chilly weather is all of the new areas to explore and catch fish which rarely hold fish during the summer months. With a few sunny days, the hard lime rock bottom in less than two feet of water along our coast between Chassahowitska and Ozello will start holding heat and attracting fish to “sunbathe” to get the energy to feed. Using a nose hook jerk bait, that’s when the fun begins. 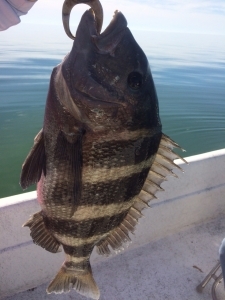 A wintertime fishing bonus in our area is the Sheepshead bite is strong. Sheepsheads, also known as convict fish, seek structure and rock outcroppings nearshore as their base of operations prior to spawning season in February. Sheepshead can be difficult to land because their specially equipped teeth, used for crunching barnacles and small crabs, make it harder for a circle hook to get traction. Light tackle, a 2 alt hook and knocker rig with a juicy shrimp prove irresistible for most Sheepshead. Winter also time brings extremely low tides and it takes an experienced captain to leap between the oyster bars and shallow shoals to find where the fish are hunkering down. Now is the time to book with an experienced captain before the busy spring season; we’ll catch fish, explore new places and have a great day on the water.